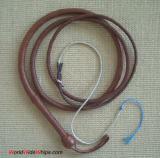 High-end bullwhip in the style of Indiana Jones / Raiders of the Lost Ark. 10ft / 12plt, made of best kangaroo hide. This heavy (960 g) whip is a beauty, see it compared to the original: Indiana Jones style bullwhip by David Morgan (12ft).